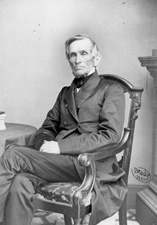 FRELINGHUYSEN, Theodore, (son of Frederick Frelinghuysen, uncle and adoptive father of Frederick Theodore Frelinghuysen, great-uncle of Joseph Sherman Frelinghuysen, great-great-uncle of Peter Hood Ballantine Frelinghuysen, Jr., and great-great-great-uncle of Rodney P. Frelinghuysen), a Senator from New Jersey; born in Millstone, N.J., March 28, 1787; pursued classical studies and graduated from the College of New Jersey (now Princeton University) in 1804; studied law; admitted to the bar in 1808 and commenced practice in Newark, N.J.; served as captain of Volunteer Militia in the War of 1812; attorney general of New Jersey 1817-1829, when he resigned; declined the office of justice of the State supreme court in 1826; unsuccessful candidate for election to the United States Senate in 1826; elected as an Anti-Jacksonian to the United States Senate in 1828 and served from March 4, 1829, to March 3, 1835; chairman, Committee on Manufactures (Twenty-eighth Congress); resumed the practice of law in Newark, N.J.; mayor of Newark 1837-1838; chancellor of New York University 1839-1850; very active in religious organizations throughout his life; vice president of the American Colonization Society; unsuccessful Whig candidate for vice president on the ticket with Henry Clay in 1844; president of Rutgers College, New Brunswick, N.J., from 1850 until his death in New Brunswick, N.J., April 12, 1862; interment in First Reformed Church Cemetery. Dictionary of American Biography; Chambers, T.W. Memoir of the Life and Character of Honorable Theodore Frelinghuysen. New York: Harper and Brothers, 1863; Eells, Robert J. Forgotten Saint: The Life of Theodore Frelinghuysen: A Case Study of Christian Leadership. Lanham, Md. : University Press of America, 1987.